This postcard view pictures Main Street as a dirt road from near the railroad crossing and looking north. The store at left has signs advertising drugs, paints and oils, tobacco and cigars. The next building north is a restaurant. 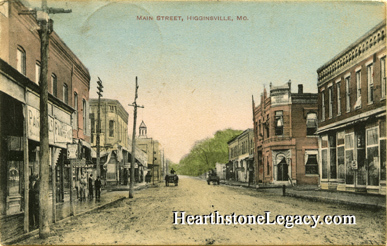 The building with the spire in the background is the old Higginsville City Hall. The red brick building on the right side of the street is the American Bank building which is still standing (2008). Published by Althoff & Koppenbrink and printed in Germany. The postcard was postmarked in 1909.